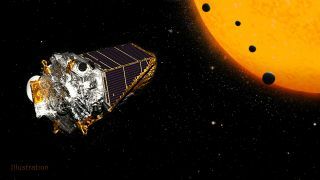 The Kepler Space Telescope, operational since 2009, is now on its extended K2 mission and will keep going until it runs out of fuel or something else goes wrong. Rocky planets are probably a whole lot more common in our galaxy than astronomers previously believed — according to the latest release of Kepler Space Telescope data last week — a scenario that enhances the prospects for extraterrestrial life in nearby solar systems. Kepler's final tally of exoplanets in the Cygnus constellation — the most comprehensive and detailed catalogue of exoplanets to date — indicates 4,034 possible planets, of which 50 are Earth-sized and reside in the habitable zone of their stars. The set includes KOI 7711 (short for Kepler 'object of interest'), which is just 30 percent larger than Earth and roughly the same distance from its star as the Earth is to the sun, meaning it receives a similar amount of energy. Scientists gathered at NASA Ames June 19-23 for the Kepler Science Conference to present their findings from the original mission as well as update their progress on K2, an extended, "second life" mission that will continue until the spacecraft runs out of fuel or something else goes wrong. Prior to Kepler's launch in 2009, astronomers mainly knew about Jupiter and Neptune-sized planets orbiting at various periods around their stars. It took the continuous gaze of Kepler's image sensor array at a patch of sky loaded with 200,000 stars to discover this sizable population of rocky-sized worlds, most of them three times the size of Earth or smaller. Many hover close to their stars, but some appear with long orbital periods putting their distance outside a habitable zone. About a half-dozen confirmed exoplanets, though, are circling within the habitable zone of G-dwarf stars — the same type of star as the sun. New planet candidates from the eighth Kepler planet candidate catalog show numerous terrestrial worlds that are near the size of Earth and within the habitable zone of their stars. The dark green span represents an optimistic estimate for habitable zone, while the brighter green a more conservative estimate. Blue circles are confirmed exoplanets, while yellow circles are new planet candidates that require follow-up observations. "Are we alone?" said Mario Perez, Kepler program scientist in the Astrophysics Division of NASA's Science Mission Directorate. "Kepler says we are probably not alone." Yet, the prospects for life on any single one of these planets remains vastly uncertain. We know virtually nothing about the size and composition of their atmospheres, or whether water is present. For example, at 1,700 light years away, KOI 7711, dubbed 'Earth's Twin,' seems one of the most promising exoplanets for life that we know of to date, given its similar orbital period (it circles its star in 303 days) and size. But Thompson urged caution in drawing hasty conclusions. "There's a lot we don't know," she said. " I like to remind people that it looks like there are three planets in our habitable zone — Venus, Earth and Mars — and I only want to live on one of them." The recently discovered TRAPPIST-1 star system, a mere 40 light years away from us, has a record-breaking seven rocky planets, raising all kinds of excitement at the possibility of panspermia, the seeding of life from one planet to a neighboring one. But given that they huddle close to their ultra-cool dwarf star, these planets are likely to be tidally locked, like Mercury. One side would be scorching and the other side frigid. Stellar flares could blast away the atmospheres of these planets or subject them to surges of UV radiation, a known detriment to earthly existence. Kepler's eighth release of planet candidates show the number of newly discovered planet candidates (yellow dots) that cluster around Earth-size. Though they represent a span of orbitable periods, notably 10 of them have longer periods similar to Earth, where they have a chance of being rocky with liquid water on their surface. But Courtney Dressing, a CalTech astronomer, offered some signs of hope, even for planets that look doomed. She pointed out that new research using sophisticated 3-D models is showing that if tidally-locked planets manage to hang onto their atmospheres, strong air currents could be evening out temperatures. "There's a chance you could have a bunch of civilizations where maybe all the astronomers live on one side of the planet and everyone else enjoys the sunny, beach-y side close to the star," she said. And UV radiation, which may have sparked life the formation of RNA on early Earth, may not be the end-all even in the form of sudden surges. For example, one study found that haloarchaea, an extremophile microorganism found in highly saline water, could withstand heavy blasts of UV radiation. "Even if the surface is a dangerous place, life could be thriving underground or underwater," Dressing said. Stellar flaring and its impact on life is an area of active research in astrobiology, given that M dwarf stars, many of which are prone to flaring, are numerous in our galaxy and host rocky planets that are astronomers' most accessible prospects for near-term bio-signature research. "Regardless of whether any of these newly detected planet candidates are inhabited, the fact that Kepler has discovered 50 potentially habitable planets and planet candidates implies that such worlds are frequent," wrote Dressing in an email. Kepler has discovered a remarkable quantity of exoplanets (yellow dots) and significantly advanced the edge of the unexplored "frontier." Rocky planets now account for a significant number of exoplanet discoveries. Future instruments are what's needed to move the science forward. Late next year, NASA (alongside the European Space Agency and Canadian Space Agency) is scheduled to launch the James Webb Space Telescope, a next generation space observatory that will be the best observation tool we have to measure the atmospheres of exoplanets close to us — a key to understanding other aspects of habitability. And also in development is the Wide Field Infrared Survey Telescope (WFIRST), which will expand the range of exoplanet exploration and build on Kepler's foundation. "It feels a bit like the end of an era," said Thompson, "but actually it feels like a new beginning."